Over the weekend I played a healthy amount of Mario Kart 8 and I can firmly say that this is the most fun I’ve had with the series in a long time. This game feels like a perfect evolution for the series with new features that make sense and a lot of returning mechanics from the previous games that are implemented in clever ways. The new hover segments, where the tires on your vehicle turn sideways and you float a foot or so off the ground, manages to feel like an integral part of how you play in Mario Kart 8 and not just a new gimmick to put on the back of the box. Hovering turns the gameplay on its head, sometimes literally, and forces you to think differently, like purposely bumping into other races to get a speed boost instead of avoiding them. It helps that Mario Kart 8 is an amazing looking game and even in local two-player splitscreen it still delivers a 60 frame per second performance. Across the eight different cups are 32 tracks, 16 new and 16 returning and all have been tweaked to take full advantage of the different modes of transportation. In one race alone you might be underwater, gliding through the air and hovering upside down. Mario Kart 8 keeps you constantly engaged by changing up the progression of the race so you never feel like you’re just going through the motions. The soundtrack is nearly fully orchestrated this time and is a huge improvement over the music of Mario Kart Wii. My only complaint about Mario Kart 8 is that the button to watch a replay of any given race is the first option after the race itself is complete, meaning that if you’re in a rush to get to the next track you’ll have a bit of delay while you quit out of the replay. This is a small gripe, to be sure, but really, why isn’t the option to go to the next race the first one you can select? 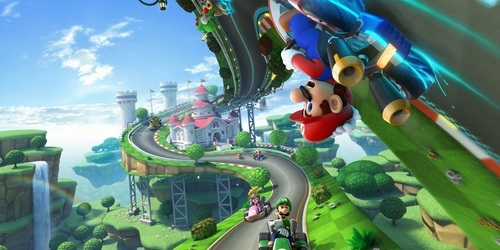 If you have a Wii U I firmly recommend Mario Kart 8, and even if you don’t own one, this is the game to get one for. Excellent track design, gorgeous graphics and the tightest gameplay of the series makes this a system-seller if nothing else. Has anyone else played Mario Kart 8? What are your thoughts on it?